Rank and organization: Sergeant, U.S. Marine Corps. Born: 4 November 1916, Buffalo, N.Y. Accredited to: New Jersey. Other Navy award: Navy Cross. For extraordinary heroism and conspicuous gallantry in action against enemy Japanese forces, above and beyond the call of duty, while serving with the 1st Battalion, 7th Marines, 1st Marine Division in the Lunga Area. Guadalcanal, Solomon Islands, on 24 and 25 October 1942. While the enemy was hammering at the Marines' defensive positions, Sgt. Basilone, in charge of 2 sections of heavy machineguns, fought valiantly to check the savage and determined assault. In a fierce frontal attack with the Japanese blasting his guns with grenades and mortar fire, one of Sgt. Basilone's sections, with its guncrews, was put out of action, leaving only 2 men able to carry on. Moving an extra gun into position, he placed it in action, then, under continual fire, repaired another and personally manned it, gallantly holding his line until replacements arrived. A little later, with ammunition critically low and the supply lines cut off, Sgt. 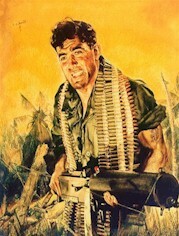 Basilone, at great risk of his life and in the face of continued enemy attack, battled his way through hostile lines with urgently needed shells for his gunners, thereby contributing in large measure to the virtual annihilation of a Japanese regiment. His great personal valor and courageous initiative were in keeping with the highest traditions of the U.S. Naval Service. Thank You for visiting our Detachment's Website. This Detachment proudly honors one of the most famous names in Marine Corps History, "Manila" John Basilone. We are all a "Band Of Brothers...and Sisters", and sincerely hope that if you are a Former Marine, FMF Corpsman or Active Duty Marine, you will consider joining the Marine Corps League. Meetings are held on the first Saturday of every month. All meetings are at 10:30 AM, and are held at the American Legion Post 25. Milltown, New Jersey.